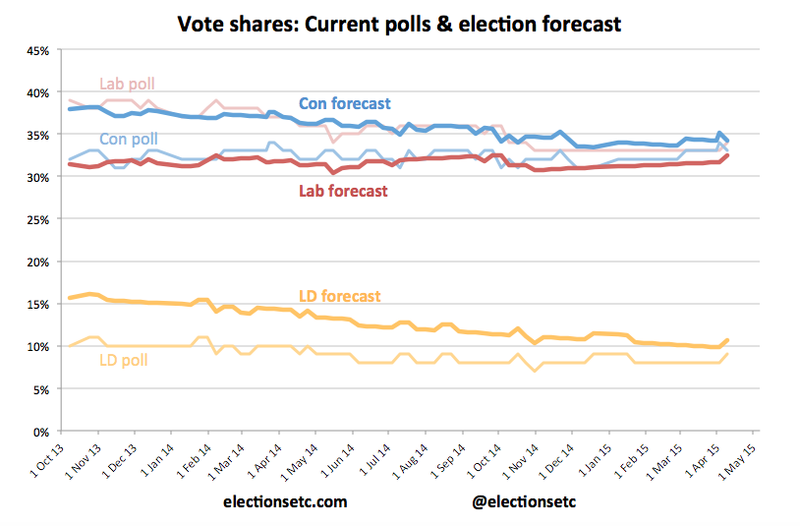 The polls have moved slightly in Labour’s favour since last week’s debate. In our polling average, they’ve gone from one point behind the Tories last week (33%-34%) to one point ahead (34%-33%). The Lib Dems have also gained a point to 9%, their best since January, while the Greens seem to be fading, now on 4%. Our model still makes the Tories the favourites to win the most votes, with a 66% chance of doing so (mainly due to their historic tendency to outperform the polls on election day). Our central forecast has them getting 34% to Labour’s 32%. Their chances of winning the most seats are similar: 67%, and our central forecast now has them winning 23 more than Labour, 289-266, with the SNP on 49 and the Lib Dems on 22. David Cameron’s chances of winning a majority have fallen back to 10%, while Labour’s are still less than 1%. The probability of a hung parliament is now up to 90% – our highest yet. However, we have Ed Miliband back in front as the slight favourite to become Prime Minister, with a 56% chance that some combination of Labour, the Lib Dems, the DUP, the SNP, Plaid, the Greens, the SDLP and Lady Hermon will have 323 MPs between them. 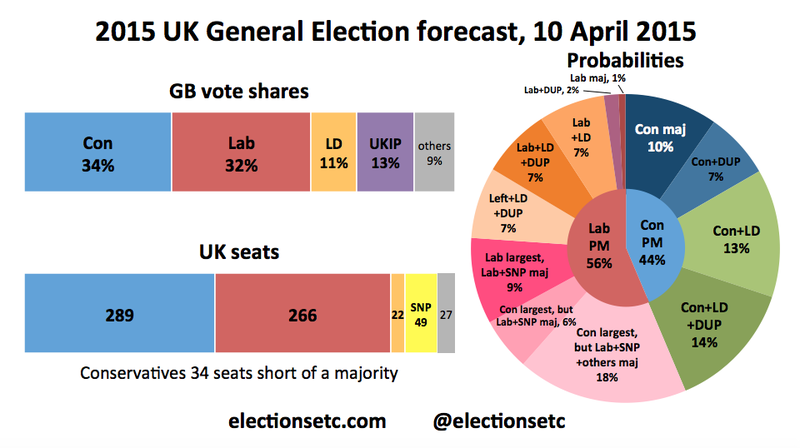 Your forecast seems to consistently defy recent polls that might suggest at least an equal proportion of the vote (about 33% each) or even a slightly lead for Labour; Also, your forecasts present the greatest discrepancy between the main parties of all the forecaster. Shouldn’t you reconsider/review your methodology?? a. Neither Labour nor the Conservatives will win enough seats to form a majority government. b. The Conservatives will win more seats than Labour. c. The LibDems are making a recovery in the polls, and will go on (presumably) to do better than previously thought at the May general election. d. The Scottish Nationalists will take a lot of votes (and seats) from Labour, thus leaving Labour with a virtually zero chance of forming a government. e. UKIP is still a significant force, but UKIP support is waning somewhat and it will only win a handful of parliamentary seats at best. Given this scenario I still see the most likely May outcome as a Conservative government with a small majority, or a continuation of the (current) Conservative/LibDem coalition. The logic behind my forecast of a slim Conservative majority is that firstly the Conservative newspapers will successfully sway a percentage of undecided voters (away from Labour) with the ‘frightening’ prospect of a Miliband government – I can almost see the cartoons now – in the run-up to election day! It may be counterproductive for a political party to carry out a smear campaign, but newspapers seem to carry it off better. Secondly, and perhaps more importantly the opinion polls have regularly underestimated the Conservative (or conservative with a small ‘c’) vote. Even the 2014 ‘neck-and-neck’ pre-Scottish referendum polls (where the pollsters overestimated the pro-independence vote considerably) illustrate this, and in 1970, 1992 – and even in 2005 – the polls were wrong in underestimating the Tory UK general election votes. It’s going to happen in 2015. Thirdly, the old Clinton campaign message ‘It’s the economy, stupid’ still rings true, and the coalition has, undeniably, made a good fist of handling the economy. I cannot believe that the onset of the better spring/summer weather and the improving economy will hinder the Conservatives (or LibDems). Quite the opposite should be true. If the Conservatives fall short of a majority, then they can always fall back on the consolation prize of a coalition with the LibDems. I know that the LibDem spokespersons currently attack the Conservatives as unwilling to ‘ask the wealthiest to pay for their share of the deficit’ etc. etc., and tell dark tales of how they saved the Conservatives from their own extremism……… but I am certain that Nick Clegg and his colleagues relish the prospect of getting back to into coalition with the Tories. Clegg has even talked about ‘finishing the job’ but what a shame that the LibDems have to now go through the motions of attacking their former colleagues and coalition partners. Ask around and you will be surprised how many people would vote, if they could, for a continuation of the Con/LibDem coalition. Perhaps the opinion pollsters should slip this option into their list when asking the public about voting intentions. I cannot believe in the prospect of a Labour-SNP coalition. Necessity makes strange bedfellows, but this would be too strange. And anyway, every seat gained by the SNP would be from Labour, so one has to assume that Labour would be forming a majority government if the SNP were not stealing their Scottish seats. This is a premise I could not subscribe to. The only other real possibility (in my opinion) is a Conservative minority government. But the option of Coalition II seems a more cozy prospect for everyone. The right wing papers of which you speak of have already been heavily shelling Miliband for weeks and it’s made no difference as times have moved on and people are now capable of thinking for themselves, the reality is that the polls have shifted in Labour’s favour during this onslaught, this is deluded and desperate wishful thinking on your part. The Tories will not be able to form a workable minority government as the SNP have made it clear they will vote down any queens speech that is put forward by them, funny how this information is conveniently forgotten by right wing prediction makers. The methodology used by Election Etc and other forecasters like it is flawed and outdated as it does not make any allowances for the new and before unseen political environment involving smaller parties who now have a larger projected vote shares. There are huge holes in these systems as for instance the calculation of how many Green votes may go to Labour is completely ignored. The Greens got less then a 1% vote share in 2010 and are currently polling at around 6% and it’s fairly safe to assume there will be round a 2% swing towards Labour in the last few weeks or through tactical voting. It will be highly unlikely that the Tories have enough seats to form a coalition of any type but it would seem to some ignorance is bliss. Only one man will be Prime Minister after the next election and that will be Ed Miliband. Enjoy the next 25 days of total delusion.